Most of the time we just call this the Chocolate Peanut Butter Smoothie. Mr. Picky says it’s his new favorite and he is usually the one to make it. You should see how many bananas I have to buy to keep up with the acai bowls, banana “ice cream” and the new favorite CPBBO Smoothie. Most cashiers at the grocery store either look at me funny or can’t resist asking me what I am going to do with 6 bunches of bananas. 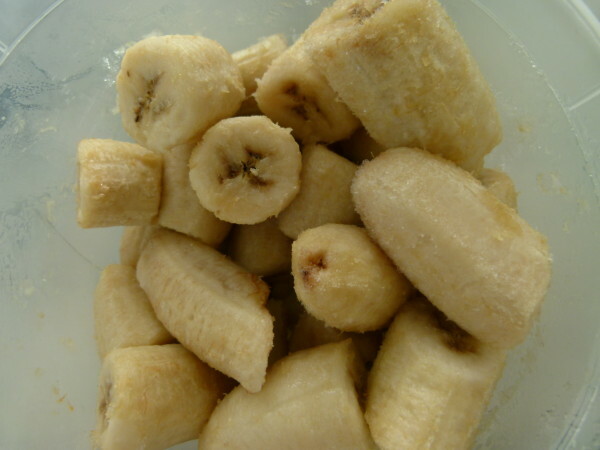 I was going to wait a while before I posted another banana recipe, but Mr. Picky asked if I would put up this smoothie so his friends’ moms could have it, too. Cute. Smoothies and acai bowls are his favorite after-school snack. I taught him how to safely work the blender and the Vitamix and as long as I’m in close proximity, he’s welcome to give it a go. As opposed to his teenage sisters, who think making a smoothie is too much work. Yawn. I told my daughter who is a junior in high school that she needs to change her attitude that spending 5 minutes to make a snack is hard labor. What is she going to do when she’s (we hope) living away from home in college? And then I said those awful words that made me sound like my parents. C’mon, all together now, “when I was your age…” Yeah, anything that comes after that is going to get the big old eye roll. But really, wouldn’t you have DIED to have a Vitamix when you were a teenager?? Or frozen acai puree?? Or an iPad which pulled up thousands of recipes AND videos? Can we just talk about smart phones for a second? What about the fact that I went to college with a typewriter. A typewriter. Yep, and that’s why it’s usually just Mr. Picky and myself in the kitchen making smoothies and acai bowls. Which is fine, because I’m soooooo annoying. OMG. What’s cool about smoothies is that you really don’t need a recipe. We completely eyeball it every time. And Mr. Picky has no idea that I am so on to him that he uses chocolate syrup instead of cacao powder in this smoothie when he thinks I’m not looking. I’m annoying and flexible at the same time. I really don’t care if he squirts a little chocolate syrup in his smoothie if it’s for an after school snack, although we all know that the same antioxidants in raw chocolate don’t apply to Hershey bars or chocolate syrup. Just saying. But if you did want this for breakfast, I think it’s a perfectly good way to start the day, provided that it’s not the middle of winter. I have a thing about not giving the kids or me really cold stuff first thing in the morning, especially if the weather is cold. It’s just too hard on the digestive system and kids have weaker digestion than adults. But back to nutrients, there’s great protein, healthy fats and complex carbohydrates in this smoothie so you could use this as a meal replacement. Feel free to adjust the flavors to your liking or add protein powder or spinach or ground flax seeds. This is just a guideline. Normally, Mr. Picky and I taste whatever is in the blender and then add a little extra peanut butter or sweetener or chocolate. Also awesome if you like to plan ahead, make this smoothie the night before and you’ll be sitting pretty come morning! Sweetener: add your preferred sweetener to taste, such as honey, dates or coconut palm sugar. With unsweetened almond milk and natural cacao powder, 3 pitted dates seems to be perfect for us. 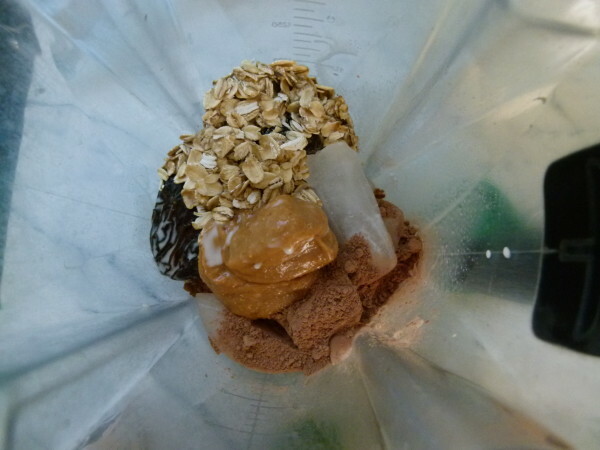 Add all ingredients to a blender with the ice on top. Blend until very smooth. Smoothie may be refrigerated overnight or frozen. *If you use sweetened almond milk, you may not need additional sweetener. 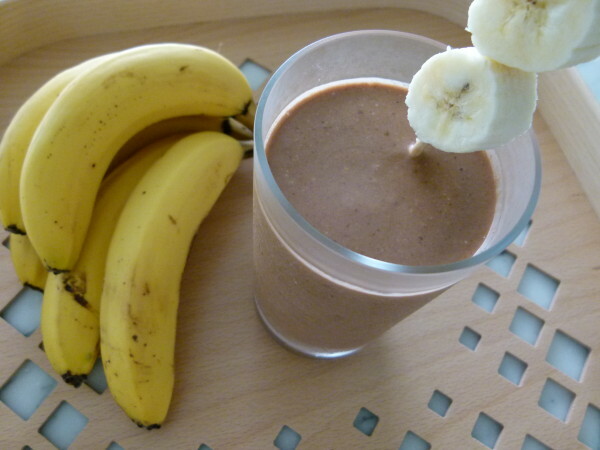 If it's not too obvious, omit the chocolate for a Peanut Butter and Banana Smoothie. 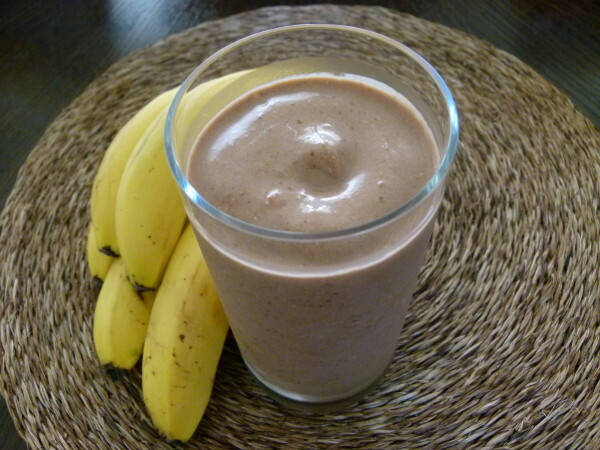 Omit the peanut butter or substitute raw almond butter for a Chocolate Banana Smoothie. 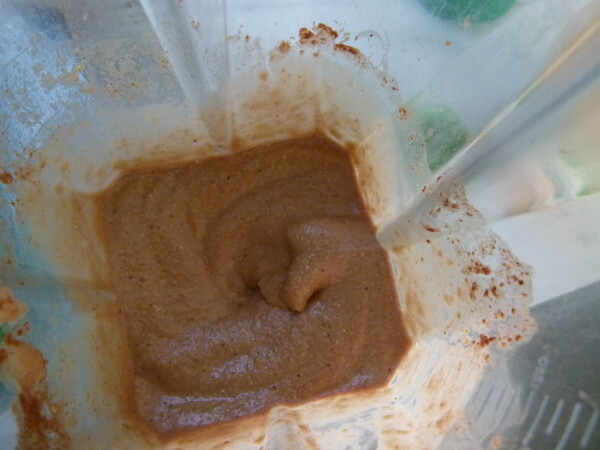 Omit the banana for a Chocolate Peanut Butter Smoothie. Wow, this is amazing! I have not ever really made anything but fruit smoothies, but I am converted now! Could be a little thicker for my taste, but I may just add a few more oats. Delicious, thank you! Interesting. Many years ago, I independently came up with almost exactly the same recipe! I’ve been using it as my power morning smoothie ever since. I add a little more milk, and sometimes I add a tablespoon of flax seed. I’ll have to look into spinach. 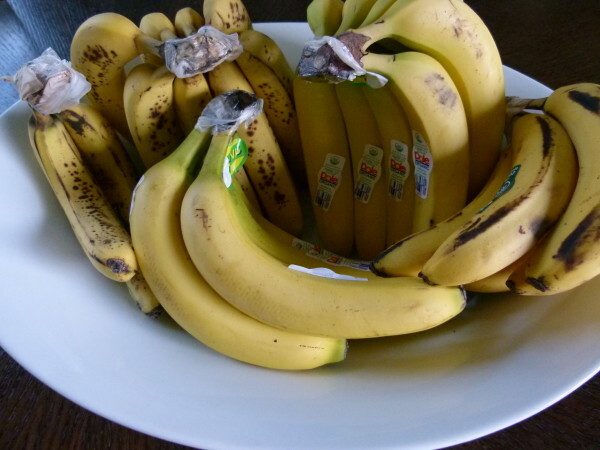 I don’t use any sweetener anymore as bananas are really sweet. I do add a 1/4 teaspoon of salt (1/2 table and 1/2 potassium salt –“no salt” brand) for flavor and extra electrolytes. I also just add whole roasted peanuts–the vitamix makes peanut butter out of them, of course, and it’s usually cheaper and less messy than peanut butter. I also just discovered Valrhona cocoa powder as the most delicious, and just bought 3 kilos of it off Amazon. Not sure, Marsha. You’ll have to plug it into a calorie counter. I love this smoothie!!! This is my go to drink every morning. I added the spinach as someone else suggested. It’s just delish!!!! I’m sure it will be delicious! Brown rice syrup is a great choice! Thanks for your feedback, Amy! What do I use in place of the banana if I don’t have one? Would vanilla or plain greek yogurt work? The banana helps to sweeten and thicken the smoothie, so yogurt and a date or a little honey would work fine. Or ground chia and a few dates. Quarter of a ripe avocado and honey or maple syrup…. Can you use Ovaltine in place of the chocolate? I don’t see why not! But here’s what I’m thinking — Ovaltine is less “chocolaty” than cocoa powder and is sweetened, so taste the smoothie before you add any sweetener. You may not need it. And depending on your tastes, perhaps a little more Ovaltine to get the right chocolatiness. Just guessing. Could I omit the milk to make this smoothie vegan? Can I use chocolate protein powder in place of the chocolate syrup for a healthier option? Absolutely! 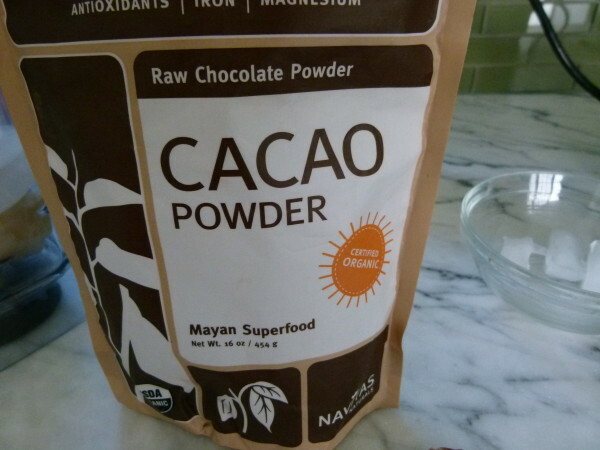 I personally use raw cacao powder, but my son is the one who sneaks in the chocolate syrup when he thinks I’m not looking. I don’t know how your favorite chocolate protein powder compares in chocolatey-ness to cacao powder, so you’ll have to taste the smoothie and adjust accordingly. Enjoy! Omg this was soooo good!!! My 2 yr old and I thoroughly enjoyed it for breakfast this morning. She looked at me a little skeptically after her first sip as if I had made some sort of mistake. Not the usual green smoothie she was expecting. Ha! Thank you, Pamela. Nice to mix it up a little, right? So happy this was 2-yr-old approved! Are you using cooked oats? I’m confused. Sorry for the confusion, Suzanne. I used raw, old-fashioned rolled oats in this recipe. But I have added cooked oats to smoothies before and that turns out great too. I am crazy for my vitamix and can’t believe I waited so long to buy one! I forgot about this traditional smoothie – I am so busy mixing up green smoothies these days. I am making this tomorrow for breakfast, my kids will think I am so cool for putting “chocolate” in it (i won’t tell them it is unsweetened cacao powder!). This is my first time on your blog – I think your writing is great! I laughed through that whole post, I can more than relate! Welcome, Heather! So glad you found me. Sounds like we’re on the same page ;). Sounds delicious!! Can’t wait to try this for breakfast. If you are preparing it for breakfast the night before, do you do anything different so that it keeps overnight…do you add ice? do you prefer to freeze it or refrigerate it? Thank you for another great recipe. I do nothing differently when preparing the night before. The blended oats keep it nice and thick. If you want it to stay icy, I suppose you can blend everything except the ice the night before and then reblend with ice in the morning. I store it in the fridge. Have you ever tried Organic powdered peanut butter. Still the great benefits and flavor but with a fraction of the fat. We make this same smoothie and use 2-3 tablespoons of powdered peanut butter. Its fantastic. 2 tablespoons of powdered peanut butter is only 45 calories and very little fat. I haven’t, Allison, but it’s funny you bring that up. A few of my students were debating powdered peanut butter the other day. Some don’t like it because it has added sugar and I guess not all the brands are organic. I think the concept sounds ok, as long as you use organic because conventionally grown peanuts are so heavily sprayed! Also, I like the idea of having some fat to make me feel full, otherwise I get hungry before my next meal. I’m intrigued by the idea, though. 🙂 What brand do you use? For me powdered peanut butter is just candy. I eat way too much of it because it is sweet and delicious, I am much more sensible with my portion size when I use actual peanut butter.